Great news! The deadline of submission is extended until December 30, 2016! 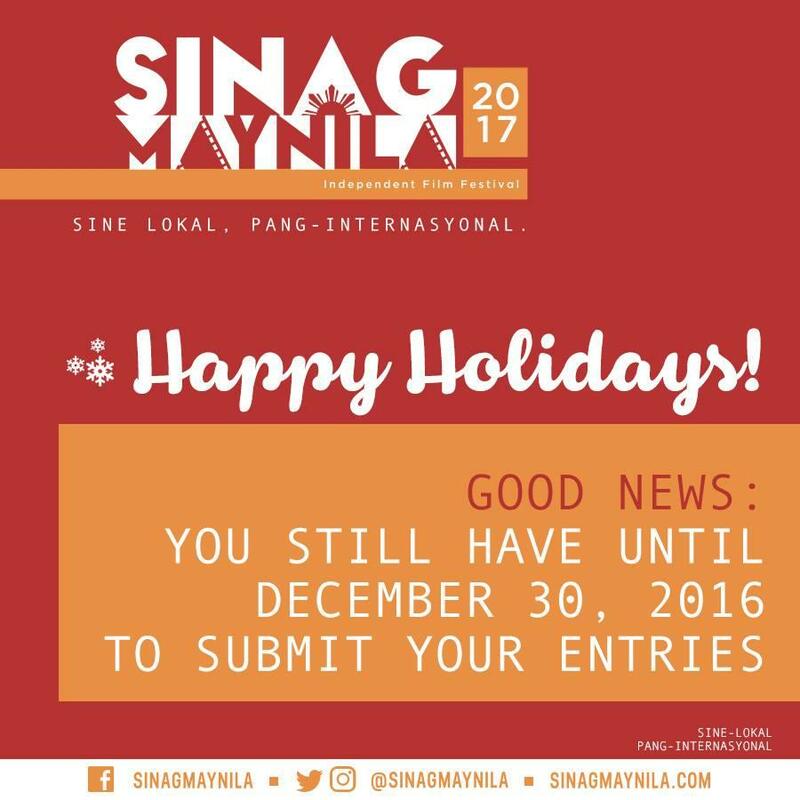 Sinag Maynila Film Festival 2017: Sine Lokal, Pang-Internasyonal is now accepting finished full-length feature films. Selected films will automatically receive Php 150,000.00 while those selected from other categories will be given Php 10,000.00 as incentive. Being selected for Sinag Maynila has been closely associated with the opportunity for international recognition, hence the new tagline “Sine Lokal, Pang-Internasyonal”. Under the supervision of Sinag Maynila CEO and Founder Wilson Tieng, and world-renowned and internationally acclaimed film director Brillante Ma Mendoza, the diverse and captivating stories of the produced films garnered attention in various film festivals overseas—Vesoul International Asian Movies Film Festival, Busan International Film Festival, Toronto International Film Festival among others. Mandaluyong City, 1552. Entries must be submitted in a long brown envelope properly labeled with the filmmaker’s name, title of film, contact details and indicating the category. Entries sent via online links will not be entertained. Watch the Sinag Maynila Film Festival Special replay on CT channel this December 24 from 7:30 PM to 11:15 PM and enjoy the finest independent films all week long! Be in the loop and join the conversation at #SinagMaynilaOnCT. Seen on Cignal Ch. 22, Sky Cable Ch 138, Destiny Cable Ch 138, and Cable Link Ch. 40.